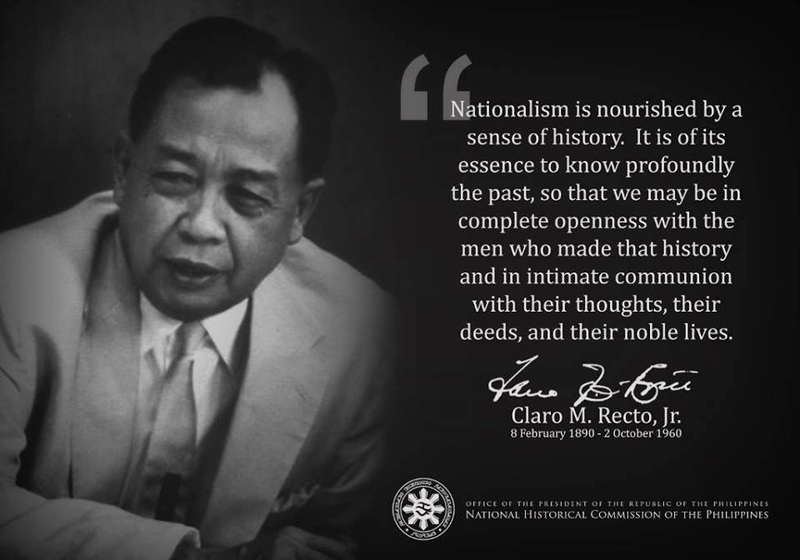 In our homeland's case, we can not afford a "balanced" approach to history since in the past and present years, our homeland's history --as it refers to Philippine-US relationships-- has been imbalanced in favor of the Americans, who as far as we baby boomers can remember, are only "the good guys" and "do-gooders" in history. You ask me about what is called imperialism. Well, I have formed views about that question. I am at the disadvantage of not knowing whether our people are for or against spreading themselves over the face of the globe. I should be sorry if they are, for I don't think that it is wise or a necessary development. As to China, I quite approve of our Government's action in getting free of that complication. They are withdrawing, I understand, having done what they wanted. That is quite right. We have no more business in China than in any other country that is not ours. There is the case of the Philippines. I have tried hard, and yet I cannot for the life of me comprehend how we got into that mess. Perhaps we could not have avoided it -- perhaps it was inevitable that we should come to be fighting the natives of those islands -- but I cannot understand it, and have never been able to get at the bottom of the origin of our antagonism to the natives. I thought we should act as their protector -- not try to get them under our heel. We were to relieve them from Spanish tyranny to enable them to set up a government of their own, and we were to stand by and see that it got a fair trial. It was not to be a government according to our ideas, but a government that represented the feeling of the majority of the Filipinos, a government according to Filipino ideas. That would have been a worthy mission for the United States. But now -- why, we have got into a mess, a quagmire from which each fresh step renders the difficulty of extrication immensely greater. I'm sure I wish I could see what we were getting out of it, and all it means to us as a nation. Once I was not anti-imperialist. I thought that the rescue of those islands from the government under which they had suffered for three hundred years was a good business for us to be in. But I had not studied the Paris Treaty. When I found that it made us responsible for the protection of the friars and their property I changed my mind. Source: From Mark Twain's Weapons of Satire: Anti-Imperialist Writings on the Philippine-American War, Jim Zwick, ed., (Syracuse: Syracuse University Press, 1992).